This is the place to learn about all of the ways you can publish (and unpublish) your Leadpages sites. 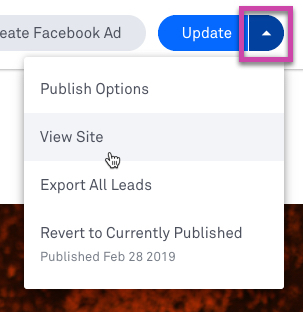 You can publish a Leadpages site to your Leadpages domain or a domain you've connected to Leadpages. Publishing your Leadpages site will overwrite an existing homepage at that domain if you've previously selected a Lead Page as a homepage in your account settings. If a Leadpages site is already published to the domain you'd like to publish a new site to, you'll want to unpublish that current site first. Click Publish at the top-right corner of the site builder. Click the down_angle button next to Update in the top-right corner of the builder, then "View Site." You can change the URLs where your site pages are located on your site at any time by navigating to the Pages tab on the left-hand side of the site builder. Click the gear icon next to the page you'd like to edit, then "Edit Page Settings." After you've published your site, you can access your publishing options both from your account dashboard as well as within the site builder. Navigate to the Sites tab on your dashboard. Click the Actions more menu next to your site. 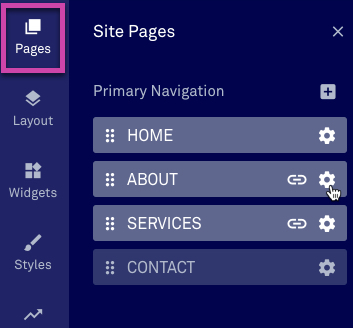 Open your site in the builder by clicking the pencil icon next to it under the Sites tab of your account dashboard. Click the down_angle button next to Update at the top-right corner of the builder, then click "Publish Options." Looking to change your Leadpages Domain? Contact our support team. 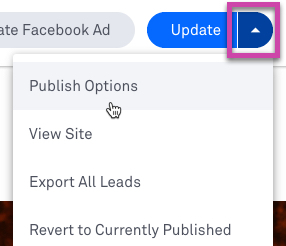 You can connect your domain to Leadpages by clicking the profile icon at the top-right corner of your Leadpages dashboard, then Domains. Only one site can be published on each domain, therefore, you'll want to unpublish your site from your chosen domain if you currently have a site published there. Navigate to the Sites tab on your account dashboard.